Welcome to our reading room. Make yourself comfortable and browse through the stacks. And please let us know if you'd like to review another book or provide additional commentary on one shown below. If you'd like to purchase a book, click on the cover to see more information or to purchase it directly through Amazon.com. What can I say? If you haven't heard the Car Talk guys on NPR, you probably don't know you need this book. But you do. Trust me on this. Buy a copy now! And tune in to Car Talk. You can find them on the web too, at the Car Talk Web site. A fascinating story about the design and launch of the "new" Taurus...Mary got the inside scoop on the real process, from Jackie Stewart bashing early prototypes, on to the steps and mis-steps in marketing the vehicle. Yates, a serious car guy, describes the planning and launch of the one vehicle that has done more to ruin the driving experience of the suburban male - the minivan. How many of us have said "Hon, I'll drive a minivan just as soon as you pry my cold lifeless hands from <fill in the name of your favorite previously owned sports car>?". Now you can gain the insiders' view of how this vehicle was brought to the market. Learn how Chrysler management was able to singlehandledly (again) bring Chrysler back from the brink with some rather astute management, and more than a little luck. Speaking of sports cars...all boys have wanted a shiny red Corvette ever since the beginning of time. Schefter tells a story that took him 8 long years to research...research that took him into the bowels of GM. He was granted unobstructed access to virtually every meeting and discussion about the planning and eventual launch of the 5th generation Corvette. Another classic! Order it today for your collection. Manifold Destiny: The One, the Only, Guide to Cooking on Your Car Engine! A wonderful book...a classic that, due to popular demand, is now being reprinted. Order your copy now before the publisher changes their mind! A classic car novel...a must read for any car buff. The movie version starred Burt Reynolds playing Stroker Ace. It's out of print, but Amazon will try to find a copy for you if you'd like. This book has some wonderful rally action photography and some great tips on how to be a better driver. Ask Amazon to find a copy for you. 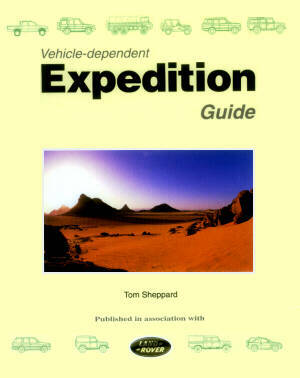 A definitive reference on expedition touring, based on Mr. Sheppard's 85,000 miles of experience. The book is a bit biased toward Land Rovers, as it is published by Desert Winds in cooperation with Land Rover...but hey, they do make great expedition vehicles. And where else will you find a country-by-country listing of the sulphur content for diesel fuel? You may never need all of the information in this book...but you sure can dream. This book is about so much more than Lance and his battle with cancer. I've taken his his approach to hill-climbing and applied it in many parts of my life. Rather than take the easy approach to hill-climbing, Lance shifts up as he approaches a hill. This counterintuitive approach to hill-climbing gets you up out of your saddle and working hard to conquer the hill...and guess what, you do! Try this in other parts of your life...when things start to get tough, then you know it's time to get to work. Yep, you know you should stretch before you ride. You may even know you should stretch after you ride. But do you know how to stretch? Bob's book will provide exercise and age specific recommendations on stretching techniques. My massage therapist strongly recommends this book, and she's right!